← Elections campaigns come and go. Homeless people are in a hopeless situation. It is virtually impossible to climb out of that world without help. Regardless of how they became homeless, a majority did not choose that life style. Circumstances beyond their control, and possibly bad decisions, lead them to this hopeless situation. Various agencies and organisations help with clothes, temporary shelter, meals and other basic needs of the homeless. But these limited resources are only able to give part relief to the symptoms of the situation. It is our politicians who hold the answer. They are the ones who can initiate action that, not only gives far more effective relief to the symptoms but, takes preventative action which minimises the number of people becoming homeless in the future. We’ve just had an election for both houses of our parliament. 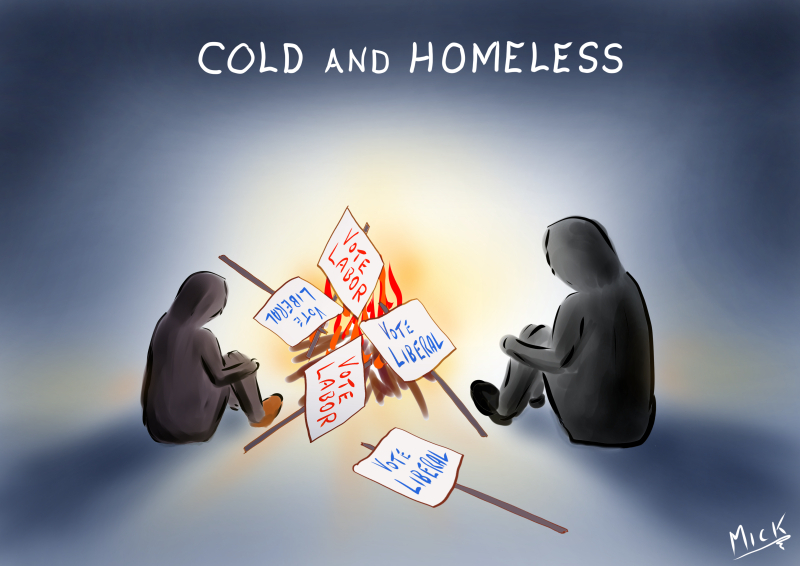 Maybe I’m stupid, but I listened to a lot of the political soap-boxing during the election campaign, and I don’t recall any promises related to the homeless. If there was any political announcement, it certainly wasn’t given much push and priority by the pollies. And yet, that would have been the ideal time for pollies to highlight their compassion in regard to the homeless, and expand on plans and policies in this area. Maybe there’s no votes in it for the pollies, who knows? I searched hard for anything in the election which may have had benefit for the homeless. That search resulted in this cartoon, which is not intended to be humorous, rather, symbolic of reality. CLICK ON IMAGE TO ENLARGE” or click on EDITORIAL/POLITICAL menu above. Posted on July 14, 2016, in Cartoon, illustration, humour, humor, caricature, political, art, Australia, Perth, cartoonist, Illustrator and tagged aid, Australia, Cartoon, charity, election, Government, Homeless, labor, liberal, Life, media, News, Political, Politicians, poverty, promises, Social media, voting. Bookmark the permalink. Leave a comment.